Raiden IV Game Machine is an aircraft game, machine install the Rainden IV game is a vertical scrolling shooting video game developed by MOSS that was first released for the arcades in Japan. This machine supports multiple motherboard types, for example TypeX, NAOMI and so on. Equip with 42" LCD high-definition screen, support multiple connectors, such as VGA connector, HDMI connector and the DVI connector. 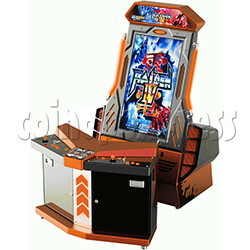 And machine mount the joysticks and buttons that SANWA brand, strong and durable, long service life. The gameplay of Raiden IV is identical to its prior instalments, although its level design is different than Raiden III, but it is exactly the same as Raiden II, as the player starts from in-land, over the farms. In later levels the game progresses through a vast cityscape, into the sky, and finally onward to space. The player faces many enemies, powerful stages, and fearsome bosses. The Flash Shot System, first introduced in Raiden III, returns in IV. Multipliers are given for destroying enemies that just appeared on screen, the faster players destroy enemies, the higher the bonuses are. The control console design for two players, and the cabinet design with yellow color, red color and blue color for option. The game modes inclue arcade mode and the Xbox 360 mode, players can get wonderful and exciting game experience.